These tiles are awesome. I’ve used them outside to cover a concrete pillar and the look amazing. They’re holding up in the hot southwest climate so far after 3 years. Drawing inspiration from artisan cement tiles, the SomerTile 7.75x7.75-inch Thirties Classic Ceramic Floor and Wall Tile exudes encaustic flair. Set on a speckled dark charcoal base, the off-white design features delicate grey freckles, giving this tile subtle definition. Soft, simplistic arcs frame the floral, old-world pattern and rendezvous to reflect Spanish designs. 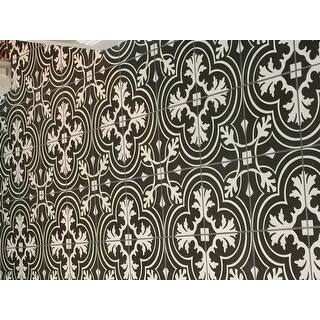 Capturing a sought after designer look, this pattern is great for bringing a custom look to your home for less. With a matte glaze, this artistic tile is an excellent choice for backsplashes, showers, foyers and exterior work. Pair this tile with the rest of the monochromatic, geometric patterned Thirties series or as a dynamic inflection for any application. Porcelain is a type of ceramic. SomerTile guarantees that any product that has been advertised as such is in fact Porcelain. Each line item within an order will be selected from a single dye lot (color) and caliber (size), but multiple orders can result in receiving multiple dye lots and/or calibers. Please ensure that all tile for a project is obtained within one order. Dimensions 5.0 In. X 4.5 In. X 0.3 In. 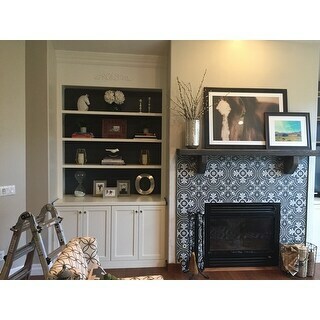 Bought this tile for a fireplace surround and it turned out beautifully. Very tasteful but still dramatic enough to make an impact in the room. Definitely use a quality tile saw blade and skip the tile snips altogether to avoid chips and/or cracks. These ceramic tiles are a fraction of their counterparts made of concrete, and they are just as beautiful. The tiles are a matt finish, not shiny which we like in the bathroom. Our tiler easily tiled the floor with no issues. 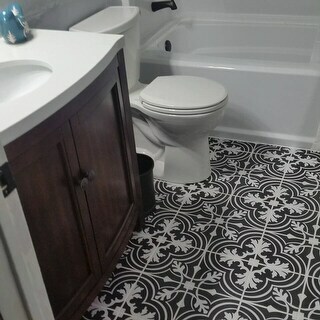 We grouted in white, but black would look just as good since the spacing between tiles is small and the design is what your eyes see. We sealed the tiles and grout just to ensure the grout would remain white. While you should seal concrete tile, you dont need to seal ceramic tile. Great color and design, but we exchanged these for a porcelain tile instead. Ceramic tiles are more slippery for flooring. I am very happy with this purchase. I went back and forth on whether to buy something like this on line but based on the many reviews I decided to take a chance (plus the price was right). I am very happy with the purchase. 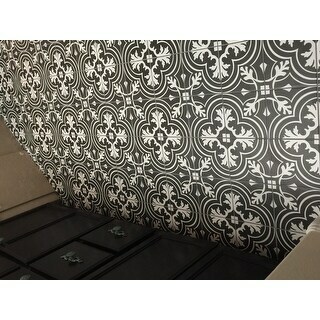 I bought them for my kitchen backsplash, I have yet to install them but doing a dry lay out they look awesome! I like it so much I just placed an order for the reverse color for my floor. The tiles came packaged very well, none were broken, and they were here before I even expected. I was concerned they would look cheap and the design wold look 'printed on', thankfully they do not. As far as Overstock goes, I found these tiles on a competitor site and they looked to be a better deal UNTIL you factor in shipping. They were charging a boat load for it, almost doubling the price. So thank you Overstock for FREE shipping it made my decision very easy. If you are on the fence... Buy them! We used this tile for the floor and an accent wall in a bathroom. It looks beautiful and was easy to work with. We have received many compliments on this tile. Beautiful tile that looks exactly as described. As recommended, I purchased all the tile at once to make sure they come from the same dye lot. The colors match and not a single tile was damaged during shipping. Great quality. The install job in our bathroom wasn't difficult at all (diyers having only installed one floor before) and the tile looks beautiful! We went with a bright white grout. One thing to keep in mind - the shades of the darker color can vary between grey and almost black depending on the dye lot so be sure and order all you will need at once to make it easier. The tile is exquisite! The shade of gray/green is perfect. It has a slight glaze making it water resistant but dull enough not to reflect too much light. But, enough about the tile. I want to praise Overstock as a shopping tool. As a designer I am amazed and excited about the range of choices I have, the world is really my "oyster". Delivery, unmatched; service, superb. The associates answered every question with honesty and candor. Thank you! I will always shop here. Do not let me down. GREAT tile! Put them in our laundry room between kitchen and garage. Really adds a beautiful look. Also should mention that our flooring and tile guy who installed for us repeated commented on the quality of these tiles. Not a one split in all his cutting, normally he says that he looses a box of tile to splitting when cutting (tiles from Lowes, Home Depot) Everyone loves these. I was looking for something unique and this definitely fit the bill. People mention the pixels and honestly since it's on the floor it isn't noticeable. Just had it installed and it's just beautiful. I have dropped things on it and it has held up just fine. The tiles arrived sooner than expected and we have only opened 1 of the three boxes. The color is a dark/med grey and a white/very light cream with a matte finish and all were in excellent condition. Considering the packaging I expect the others to be in equally good condition. I have laid out the the tiles so that I could view the pattern and they are beautiful. At this point we are very happy with this purchase. I found this to be the best value available even though the tile is available on several sites. I loved it so much on the floors that I ran it up an accent walls on our master bathroom. I mixed it with dark wood and an ornate black wrought iron chandelier over a black and white soaker tub and I am in love with this room! This tile is somewhat thin so we did have some breakage not on delivery but on the job site, so you might want to order a little extra. Beautiful product. Too thin for flooring. I have a few cracked tiles already. At Home Depot you can buy single tiles to replace them. I ordered an additional box from here and now I have too many. Look great, though. Gorgeous tiles! I tiled my bathroom entirely with this Morrocan styled tile with a shower enclose and up to a 3 foot chair rail. A green gem tone paint makes this tile pop. A wonderful tile for the price. Love this ceramic tile. It reminds me of Moroccan tiles I wished to ship home while visiting there, but prohibitive due to the shipping expense. Here it is delivered to my door and I have the exotic look without the trouble. Thanks! Love these but some boxes were a little lighter than others. Created a headache for tile guy. Open all boxes and inspect when they arrive. Don’t wait! 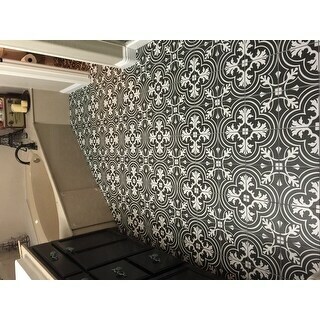 Used these in the foyer with the solid grey tiles as a boarder. Did not like the darker grout, would recommend a light grey color. Color is more of a charcoal grey rather than black. Which is what fits our home better. Purchased to lay on the guest bathroom floor. Very nice, unique pattern. Just came and it is beautiful. Exactly what i wanted! Bathroom turned out great. Good quality! "Hi, I'd like to order this. I want the grey/green tone (more vintage look). Is it possible to request that? I need 2 boxes. Thank you. " 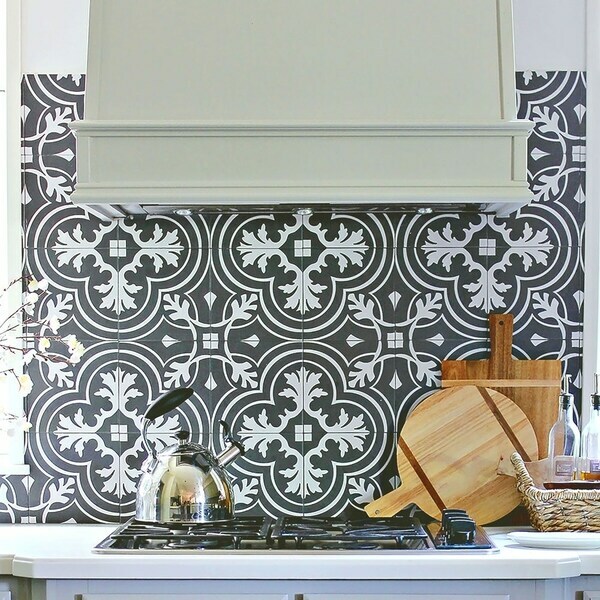 This tile only comes in a charcoal and white color. There are no green versions available. "What square footage would this be for one box of 25?" Specs on this page say 11 sq ft per box. "I am hoping to order this today. Please let me know if today's batch is the black version 3R or the lighter version grey 3G1?" There isn't a dye lot specified to a certain day. Please contact us at 1-800-The-BIG-O (1-800-843-2446) to request the certain dye lot you need. "We need to cover 110 sq feet, that includes 105 over for any broken or chipped, so is that 12 boxes I would need? We are looking for charcoal grey or grey, is this batch like that or more black? The reviews say conflicting things on color due to different lots." It all depends on the dye lot. I had ordered some and they were almost black and then I needed more and order more and they were more gray. I had to send them all back and reorder so I got from the same dye lot. Since each case of 25 tiles covers 11 square feet, you will need at least 10 cases to cover 110 square feet. Unfortunately, the color of the tile will depend on the dye lot you purchase, so it is difficult to say if the color you receive will lean more towards black or grey. "I have read reviews that conflict about what color this tile is. Is it grey, black, grey/green?" It's a dark, charcoal gray. We used it with charcoal colored grout and it looks beautiful. We've gotten tons of compliment and I would highly recommend. I would say mine was black, not grey. I used a charcoal grout as well. "Can you tell me what dye lot/run you have instock? I have ordered this exact tile from ***, and had to send it back because it was more of a slate grey and not the washed out black I had previously ordered in sample tiles. I am looking for more of a washed out black/dark charcoal color than a slate or medium grey color. I talked to the *** company, and they said that each lot is different with some tile being darker and some being lighter depending on when they get a new shipment in. Let me know what you have on hand in the warehouse if you can. Thank you very much"
We currently only have 3 cases of the old dye lot (2VPri) and the rest of our inventory is in the new dye lot (Pri3H). "Are the tile slippery when wet, as in a bathroom floor"
Since this tile has a matte finish, it should be fine as far as slip resistance goes. However, you should always take precaution when stepping on a wet tile.